I knew we were in trouble when I opened the car door and brown water started flooded in. ‘Shut the door!’ shouted Vanessa. “Mon Dieu, Mon Dieu!” muttered our French driver, holding her head in her hands. The small country road we had driven along in brilliant sunshine only a few short hours ago was now a raging torrent of water. I tried the electric windows, no power. I saw the water was rising quickly, it was now half way up the car door. Another turn on the damp ignition key and the car spluttered back to life. The electric window came down, and heavy rain water lashed in. I turned to see how the driver was doing and all I could see was a pair of legs as she tried to climb into the back of the car to find her mobile phone. Our driver (Sylvie the cleaning lady of our rented gîte) was frantically trying to phone a neighbour, in our broken French we could make out that Dominique had a 4 x 4 with a Winch, but Dominique was out and the water was rising. The water started to lap over the bonnet. I suddenly felt the car move, like we where being lifted up. I came to the conclusion……….we were going to have to jump. I really started to panic. I turned around, imagining Vanessa poised to jump into the front seat and out of the window behind me. Instead, Vanessa was hysterically laughing in the back seat of the car. “I’m not jumping out of a car window, we’ll be fine” she said. The next 5 minutes were a blur. My technique to try and convince Vanessa to jump out of the car window into raging water was just to repeat ‘VAN..NES..ER” louder and louder. Sounds of hysterical laughter from Vanessa intermixed with a variety of French swear words came from the back seat. The car inched forward, it was like a snow plow with water being parted, the water splashed onto my arm over my open window, I inched up the window, the exit route was looking narrow! I was about to perfect my Olympic duck dive attempt, but one last roar and the car miraculously pulled out from the river road. In an instant we had crossed the chasm, we then proceeded to drive at breakneck speed into town in complete silence. I later learned that the Boulangerie closed at 1.00pm on a Sunday (it was 12.55pm) and apparently the thought of us not having ‘du pain’ on a Sunday seemed to be a powerful motivation for driving through waterlogged roads! View from our gîte south of the Luberon, Provence. I was now affectionately known as “Indiana Jones’ by the neighbors. 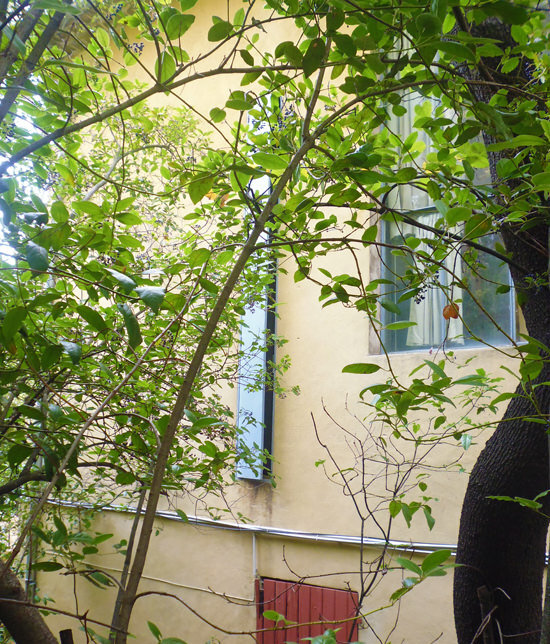 The next morning was a beautiful sunny day, as were the next couple of weeks and we finally made it to Cézanne’s studio. It was hidden amongst the trees on a steep slope to the North of Aix-en-Provence. Aix is a really lovely city with elegant architecture, charming side streets with delicious smells tempting you as you wander down the narrow lanes. Cézanne grew up here and dotted around the center, especially the grand tree lined ‘Cours Mirabeau’ are many traces of his past. 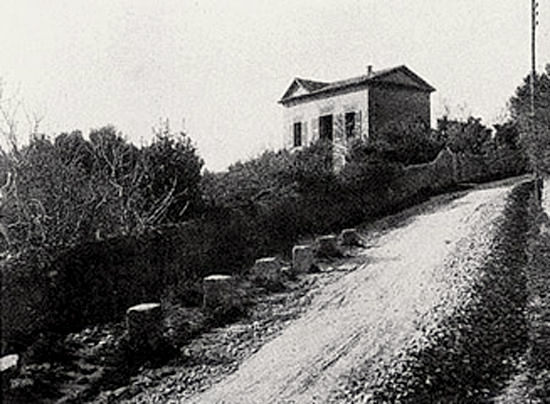 His Lauves studio in Aix was built on an isolated road in 1902, that at the time was called the Chemin des Lauves and is now named Avenue Paul Cézanne (although it is still called Chemin des Lauves further north) and originally Cézanne’s view was left clear so he could see the surrounding landscape. 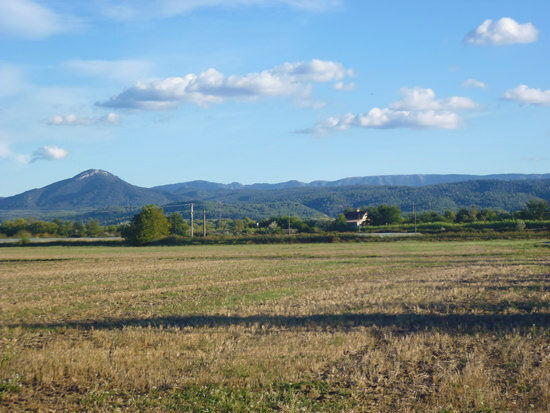 It was close to one of his favorite subjects, Mont Sainte-Victoire. 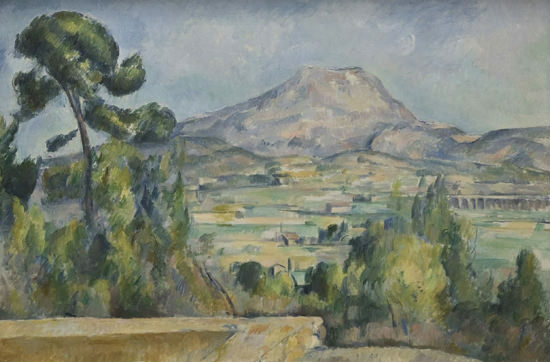 Cézanne painted Mont Sainte-Victoire in Oil more than thirty times. The studio was on the first floor and was squarer than I had imagined. 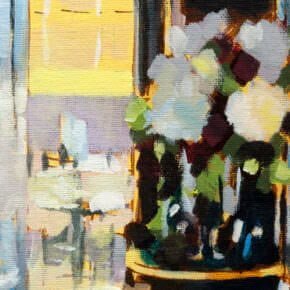 There were windows on both sides, shuttered to the front and a solid bank of glass to the rear but what was really fascinating was, there are so many of the objects from his paintings and his personal palettes and equipment, it really felt like he’d just popped out. 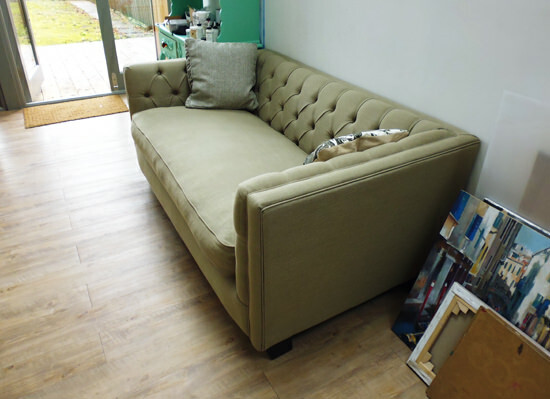 One of the first things I noticed on entering the studio was a ‘daybed’ that had a remarkably similar resemblance to one I had just purchased for my studio. Both had a canvas finish, both had only one Cushion. It appears that afternoon naps seem to suit artists of all generations! I’ve tried to colour match it as best I can remember, but the light in the south of France is much different than the middle of England! 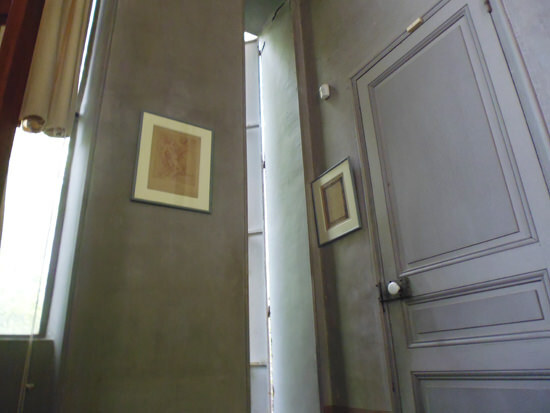 One of the most intriguing features of the studio was a narrow door, built into the side of the studio. Cézanne had it built in so he could move large canvases in and out of the building, a genius idea! His still life setups, skulls, oranges and palette’s were still present around the studio as were his hat, cane and painting satchel. If you’ve read stories of Picasso you could fool yourself into thinking creating art and learning to paint is only for the young geniuses. But you’d be wrong, Cézanne was a late bloomer. If you go to the Cézanne room at the Musée d’Orsay, in Paris, the paintings you’ll find along the back wall were all painted towards the end of his career. The paintings he created in his mid-sixties were valued fifteen times as highly as the paintings he created as a young man. Its never too late to re-invent yourself, or try a new creative path. What are we afraid of and why are we waiting for the ‘perfect time to start’? Many of our first new creative endeavors can seem amateurish, but Cézanne had his own artistic struggles and personal doubts throughout his career. He struggled for much of his painting career with his classical drawing skills which he felt were weak. Many of Cézanne’s paintings use distorted perspective and shapes took on a more abstract feel than many of his representational contemporaries. He liked to break down the composition into simple shapes, but some other artists of the time found his compositions a bit too ‘out there’ and he was even petitioned after one Impressionist exhibition to have him banned from other shows because his work was too controversial – Imagine that! English art critic Roger Fry wrote of the early Cézanne. Cézanne tried to improve his drawing skills by copying Old Masters in the Louvre when he was living in Paris. It is said that he hated the Paris Salon, but continued to try and enter it every year even after failing to be accepted to the Paris Salon, École des Beaux-Arts. When painting a portrait of the Art critic Gustave Geffroy who had written several articles praising his work, it took Cézanne 3 months and over 80 sittings …. after all this Cézanne announced the portrait a failure. He was notorious for slashing his canvases when feeling frustrated with his painting, and on one occasion whilst painting a portrait, walked away from his easel, tore 10 watercolours from the wall, threw them in the fire and then proceeded to continued the painting with a new sense of calm! Mmm, it’s time for a lie down on that couch again. Cézanne was painting for many years but he also had a lot of guidance. Cézanne had quite a dream team around him to encourage and help him with his career. The Success Coach – Émile Zola, the writer who Cezanne grew up with who took him to Paris, advised him on budgeting and was a constant encouragement to his paintings. The Painting Tutor – Camille Pissaro who often painted alongside him in the fields. He taught him the basic skills and techniques of how to be a better painter. The Art Dealer – Ambroise Vollard, the French Art dealer who tracked down Cezanne’s work and brought it to a bigger audience. In 1895 Paul Cézanne held his first solo exhibition in Paris and Ambroise Vollard bought every artwork. The Banker – Louis-Auguste (Cézanne’s Dad) Cezanne relied on the ‘bank of Mum & Dad’ , literally, to fund his career as a young painter. His father wanted him to become a Lawyer and he studied Law for a couple of years, but painting was his true passion. He was in a privileged position to experiment with his paintings whilst he dad tried to encourage him to be a Lawyer. Over 100 years ago this month, Cézanne left his studio to paint the same scenery in Provence on foot. He was also caught in an unexpected Provencal thunderstorm. But for Cézanne, the unpredictable weather took its toll, he collapsed in the rain. He was taken back to his house by a passer-by but died six days later on 22 October 1906 from pneumonia at the age of sixty-seven. Instead of saying ‘one day, some day’ and reading another article about a soggy baguette, take action on your creativity. Don’t waste time, keep going through your harshest critics (which is often yourself) and try starting today. Sounds like a great adventure Will. I too visited the studio a few years ago, when I was staying in Aix-en – Provence. I thought it was very atmospheric. Hey Sheila, yes it did have a lovely atmosphere to the studio, pleased you enjoyed your visit, isn’t Aix wonderful! Thank God you are safe after that harrowing experience with the water scare. That was an interesting story! Thanks Alleen, pleased you enjoyed it. Hello Will, great story and loved hearing about your issues with the trip. I am glad you came through the storm wonderfully. 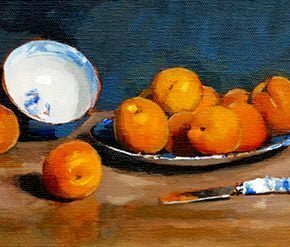 Still working on my orange reflections and I am enjoying the class information. Thank you. Hi Virginia, nice to hear from you. Pleased you’re enjoying the reflections course and I’m happy to be on dry land! Hi Will…..loved reading your adventure! We also visited Cezanne’s studio ,I found it quite moving and inspirational. Good to know he had struggles as well !! Hey Tess, yes it is a very moving place, pleased you enjoyed the article. enjoyed comments re your Provence stay and wise advice concerning age not being a barrier to painting. Thanks Keith, age really isn’t a barrier to painting, one of the blog readers is an avid 93 years young painter, who is still exhibiting! Thank you, Will, for this piece. It has been a particular inspiration to me as a rather “old guy“ to read about Cézanne and many of his own self doubts. Most of those I share myself and to know that a great artist like Cézanne had those doubts is encouraging. So the variety of your thoughts and ideas are more than welcome. Thank you for sharing your gift. My pleasure Wayne, yes, even the great masters faces daily internal torments when painting, glad you’re feeling encouraged with your own paintings. Great article and adventure. We Texans say adventure is what men are made of. Just not too many. Thanks for the good words. I am 68 and restarting painting after being in other arts all my adult career. What a challenge to start again at this age. Cheers Ken, I think I might have to increase my adventures to compete we a Texan! really pleased you enjoyed the article. I would like to say that I was truly inspired by this story for a variety of reasons. I have loved creating artwork all my life but not until I met my second husband about 12 years ago did I take it up in any dedicated, serious way. I am now 60 next month. He has been my biggest fan all this time and I have created more works of art in that time than I have in my whole life I think, because of his encouragement and ability to fund a lot of my expenses. Having said that I have not really ventured out of my own way of doing things and limiting myself to what I learn through books and trial and error. I know what I need is a mentor and other than taking in some classes I don’t know how to find one but I feel this urge to take in so much now as I want this to be my retirement career but I am frustrated by only 24 hours in a day. I recently retired and am now pursuing this direction with fear and trepidation but I am also so excited about how much time I can devote to my art and although it is small I have a beautiful room in our new apartment with a large north facing window and a table filled with my hundreds of colored pencils (my medium of choice right now) so your last two comments have become my mantra these days and I am investing in a marketing consultant to help me get my work out there in a professional way. When I begin to make sales, I am planning on reinvesting that money in myself and some good workshops to expand my knowledge. I have never read anything about the masters and have seen very little but after reading your excerpt here I think I will go to the library and start with one artist and delve into his life a bit and see if I can be inspired some more. Any suggestions on who I should start with? Thank you for sharing this in such a neat way. Really fantastic to hear about your enthusiasm and energy for creating. Having the time to experiment and learn new techniques is a real luxury. Even though I could suggest many artists that have inspired me for you to study, the best way for you to find your own inspirations and style is to visit a local museum or gallery and study paintings up close. Artists for generations have gone to museums for inspiration and just walk the halls of the gallery and start to see what you are drawn to is often one of the most enlightening way of discovering new artists, both past and present. How wonderful to stay in that apartment in Aix, yes I completely agree, the one thing I wish I could have brought home was the light! Cezanne is one of my favorite artists! Thank you so much for writing about him and showing photos of his studio. I enjoyed your adventures and especially healing about Cezanne ‘s struggles as an artist. How wonderful that you got to visit his actual studio, which looked wonderful. Wood floors? Wow, wood never put wood floors in my studio today. Anyway, thank you so much, really enjoy your posts and classes. Hi Connie, really pleased you enjoyed the article and that you also love Cezanne’s work. This was so interesting. Thanks for sharing and also for the marvellous descriptions of your escapade. Your writing is really engaging. Just wondering if you’re going to have a pet parrot, too…. Hi Jennie, pleased you enjoyed the tales, Mmm a Pet parrot, now there’s a thought! Enjoy your Cezanne article and hearing about your water experience. I am about o be 65 and beginning painting seriously, not or fame as I am an amateur, but for myself because I enjoy it. Didn’t Grandma Moses start very late in life? I agree with you…don’t wait until “some day” do it now! Thanks for the article. 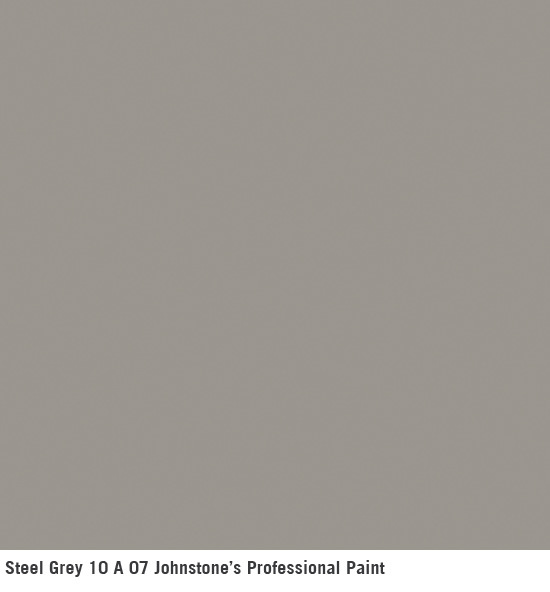 Hi Joanne, great to hear you’re embracing painting at 65! Yes, I believe Grandma Moses did start her art career later in life, I think in her late 70s – and what an inspiration! Starting to paint, or create, at whatever age really is the most powerful thing. I too have been to the studio and was very moved. I will take your advice and carry on, no matter what. You’ve got it Mike, just working through the process of painting can be hugely beneficial. You’re welcome Derrick, pleased you enjoyed the article. Thank you for this. I’m 65 this year and just learning to paint. Encouraging to keep trying. 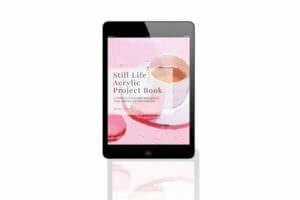 PS – love your acrylics video course. Hi Elizabeth, pleased you’ve been enjoying the acrylic painting course, and fantastic you are learning to paint. Keeping trying when your paintings never seem to be going anywhere often leads to breakthroughs in your own style. Will, terrific article and pictures. I felt as if I were there. So glad you didn’t meet his fate. Thanks Sara, kind of you to say so, it was a bit touch and go! Thank you so much for sharing your wonderful visit and interesting notes of Cezanne’s life and his art. I am enjoying my new found interest in painting so much and although a hopeless beginner always encouraged by your comments. Glad you enjoyed the article, we all start somewhere as a beginner but it’s continuing the painting process that develops your techniques. I think you should chuck ‘hopeless beginner’ in the bin and rename yourself ‘an enthusiastic student’! Wow Will! what an adventure! 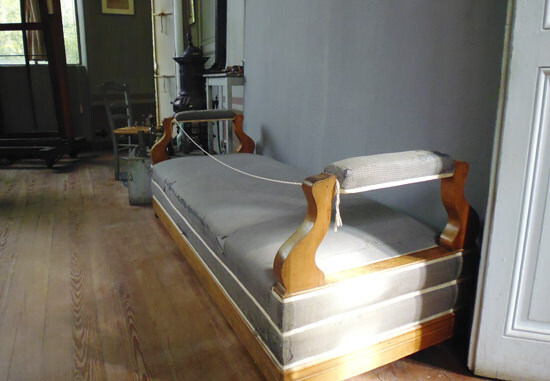 sounds as though the weather’s spookily trying to Cezanne you.I’m glad you don’t have your day bed corded off yet. 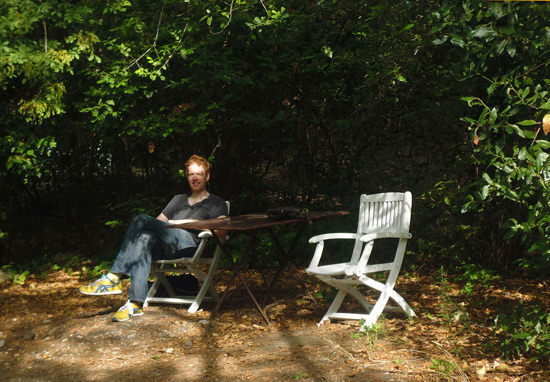 Great news about your garden studio! I can highly recommend a day bed as a worthwhile purchase to put in it, I’m still making excellent use of mine. Excellent article/advice! And for me, after a completely wasted Saturday ‘painting’, just what the therapist ordered! We’ve all been there! As long as you didn’t throw it in the fire, you’re one step ahead of Cezanne! Even an unsatisfactory day painting isn’t a wasted day painting as these are the days that you’re unconsciously stretching yourself and learning. Nice to hear from you, Vanessa is still laughing about it now! I think when the ‘driver’ only had her feet enabled to drive the steering wheel the hysteria hit a high! hope your artworks are going well, speak soon. Keep painting, communicating via video and writing! I enjoy them all! Hi Patricia, pleased you enjoyed the story, Aix and the surrounding landscape is so lovely isn’t it. Cheers Connie, I’m really pleased you enjoyed it. Hope you’re enjoying your degree and a designated power nap! The whole of that Region in France is really lovely and well worth a visit if you can. Thanks Will, I found that really interesting. I’m currently suffering from a severe lack of belief in myself but am reassured by the fact that, like Cezanne, I too have a parrot (Eccles, a blue-fronted Amazon). Well, it’s a start. It sounds like it’s time to train Eccles up! Glad you enjoyed the article and are feeling inspired on to paint through your self doubt. Very inspiring, I felt if I was there from your discription.Thank you for bringing me back to my canvas. Good one John enjoy your next painting day, so pleased to hear you’ve been inspired. Thanks Cynthia, really pleased you enjoyed the article and have been inspired to seize the day! Will.. Thanks for this wonderful article. inspiring! Hey Ganapathy, nice to hear from you and hope you’re keeping well. thank’s a lot for letting me make an excursion to Cézanne’s life. Thank you for the pictures, too. I wish it will motivate me to continue drawing. Glad you liked the photos and you are feeling inspired to challenge yourself to keep picking up that pencil. I love this! 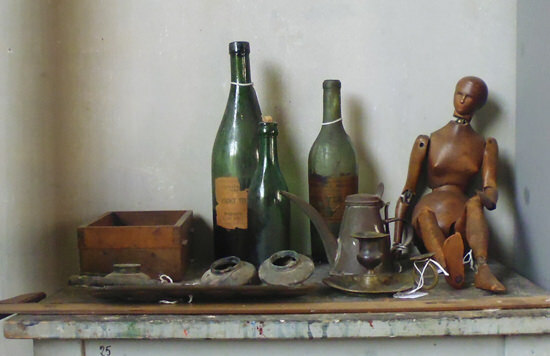 Love the pic of you, and loved your pictures of Cezanne’s studio and comments. Especially that someday is today, the support he had around him that moved his art out of the studio and into the world, and his troubles drawing. Thanks so much. As a Monday painter (graduated from Sunday) I’d love more instruction video’s too. Hey Gail, thanks very much for your kind comments, so pleased you enjoyed the article. Thanks Will, Very interesting and a nice escape from a wet, grey Monday in London ……. I’m off to buy a parrot. It’s equally wet and grey here in Cheshire and I’m missing the sun already. A parrot would be an excellent investment, just imagine ‘Daisy is a great painter”Daisy is a great painter’!! Wow, what an adventure! Glad it turned out well! (esp. The New Yorker article)! So pleased you enjoyed the article and the New Yorker one is a great read. Thank you so much for sharing your adventure with us. It made my day!! I enjoy you website and work! Thanks for dropping by Cami, really pleased you enjoyed it. Thank you so much for the Cezanne article! It is informative, interesting, amusing and above all inspirational. Tomorrow morning I will tackle my current pesky painting with renewed energy and optimism. More along the same lines would be lovely! Thanks for your kind word, brilliant to here you’ve been inspired to face your painting with a new sense of vigour and purpose! I have a book of portraits by Cezanne and have seen his works in Paris, but never been to Aix, so it’s good to get some photos and an account of his studio! As usual, you have both entertained and inspired me ~ thanks! Hey Carol, great to hear you’re feeling inspired, Aix and the surrounding area really are worth a visit. What a wonderful visit , you nuts have enjoyed every minute of it . Will you go back or where is your next adventure going to be . Can you remember your first painting you ever did ? Nice to hear from you and so pleased you enjoyed the article, my next trip won’t be until the Spring which might be heavily influenced by a wine region! Some of my first paintings were watercolours of neighbours properties at about 11 years old, I’ve always been inspired by architecture, the lure of an icepop and hard cash! I was so sorry to hear about your loss and all the inspiration for your painting. It’s a real difficult return to something as emotional as painting when there are other painful memories associated with it. Thanks Will for a great article. Lovely to hear from you and I was so sorry to hear that you had lost your good friend and inspiration for your creativity. It’s a really difficult journey finding your way back to painting when something so traumatic has happened but I believe that your friend was right. Even if you took one paint tube out of your box and covered an entire canvas with that colour and then put your brushes down and asked no more of yourself for that day, you’d have broken the habit of not painting. 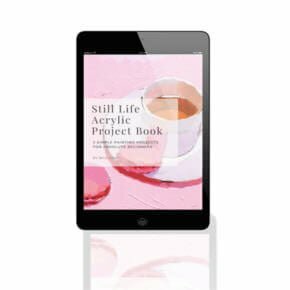 It’ll be the first step to reigniting your passion for colour, paint and canvas. I still remember my visit to his studio 60 years ago. Seems to have been cleared up quite a bit. I remember on his easel was a canvas obviously deliberately slashed although having only a few brushstrokes on it. A note said it had been taken from the dustbin after his death. I remember thinking how wasteful. Temper temper? Hey Geoff, wow, the studio must have had some atmosphere then! 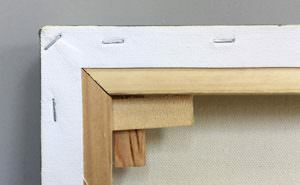 interesting to hear about the slashed canvas at the easel, so nice to hear from someone who visited the studio then. What’s an amazing adventure! Now you probably can see the funny side of this story-:) and I loved how you wrote it with nice sense of humour! And thank you very much for an interesting Cezanne article! Thanks Tania, great to hear you enjoyed the article, we do keep on laughing about it! Thank you for the inside story on Cezanne. For my birthday, my husband bought me an “escape hammer’ from Hammacher Schlemmer so that if the electric windows should fail, we can exit safely. My fears are calmed. An escape hammer sounds like an epic idea, I don’t think my flip flops would have cut it! A really fun post. Thank you for sharing your adventures. Thanks Neil, so pleased you enjoyed the article. Thank you for writing this piece and including those lovely photos. Your writing entertains, encourages, and inspires. As I have just started taking painting classes at the age of 58, your line of “what are we waiting for” is a question with which I can relate. Spending time on your site is joy! You’re welcome, fantastic to hear you’re feeling inspired to create! Thanks again for your kind words. That’s an awesome article! Thank you for sharing! So encouraging. Thanks very much Carolyn, kind of you to say so. Loved this article and photographs! Thanks for “taking us on the trip” to Cezanne’s! I too, am a ‘late bloomer’ – just beginning as I approach the age of 50. Inspiring to read! Thanks very much Babette, so pleased you’re feeling inspired with your paintings. Glad you made it through that flash flood in Provence! You’re quite a talented writer as well as painter. I just retired from teaching and at 70 have restarted painting. Your videos are quite inspiring. Thanks for taking your time, interest and talent in communicating with this online painting community! Thanks Ed, very kind of you to say so. Really pleased you’ve restarted painting, getting going again can always seem like a massive leap to take, so good on you! What a wonderful article! It is well written, and inspiring. I’m going to teach a watercolor class this evening that is located at a home for recovering drug addicts. I will share some if the struggles of Cezanne with them so that they can see the commonalities of the human struggle. Hi Rebecca, lovely to hear from you. Inspirational to hear how you will be sharing some of Cezanne’s struggles with your class. It is often easy to forget that famous artists faced many of the same feelings of self-doubt and insecurities as many beginner painters do. Have a great painting session. Thanks Swapniel, kind of you to say so. LOVED your story of near survival. I probably would have followed your lead and jumped out of the window. Thanks for the lecture on Cezanne. I am familiar with his works and life through my study of Van Gogh. Both felt totally inadequate as a draftsman and a painter. I can understand those feelings too. Does a painter ever feel totally adequate? I don’t think so. There are many other facets of Cezanne’s life that one would enjoy knowing and a few that would surprise you. Learning about artist , is learning about art. Nice to hear from you, and really pleased you enjoyed the story, I think we are often our own harshest critics when painting or drawing. However, its this feeling that we could do better, that always has us striving to paint or draw again! Hey Rosalie, thanks for dropping by and for your kind comments. Oh what a brilliant story! Loved the pics including the ones I conjured up in my mind of the rain sodden car, erratic electronics etc (I know all about this in the wild wet west of Ireland!) Also, I am out of the doldrums, watch out palette, brushes and paint Cleo is on the warpath! Cheers and thanks for taking time out to wrote about your adventure. Hi Cleo, thanks very much for your kind words and so pleased the story resonated with you. Enjoyed reading about your trip/adventure, and seeing your photos. Great story! I have pinned it and liked it to my Facebook! Thanks Pandalana, so pleased you enjoyed the story and thanks for the pin! Thanks for sharing ,I Totally love Cezanne’s work.It looks like your trip was full of interesting details.Love the idea of the narrow door at Cezanne’s Studio.Enjoy the story of your trip ,I feel like I was almost there too.Thanks for let us know that we can improve our painting ,never too late.You’re a cool guy. Thanks very much Gina, so pleased you enjoyed the article. Muchas gracias Gina, tan contentos que haya disfrutado de este artículo. Thanks very much Mundo, you’re too kind! Hi Will, Loved the story – if you ever tire of being a painter, I’m sure you could earn a good living as a writer!! Thanks Elaine, very kind of you to say so, pleased you enjoyed the story. Very nice post! A charming combination of travelogue and inspiration. Made me want to plan a pilgrimage of my own…maybe in a Range Rover. Ha ha, a Range Rover would have been an excellent choice! Thanks for the information about the dream team. I found it really encouraging to find out that he relied on a lot of support and help and that painting for some people is really work and practice, practice, practice. You’re welcome Lisa, pleased you’re feeling encouraged! I loved reading about your travels and the photos are superb! I am going to Paris this winter but can’t squeeze in Provence, thanks for giving me a unique glimpse. Thanks very much Sandra, kind of you to say so. Enjoy Paris! Hi Shirley, really pleased to hear you enjoyed the article and are seeing some great progress in your own acrylic painting. So pleased that the colour mixing exercises and tutorials have been helpful in your work. Glad you had such a successful venture and thank you for sharing your experience. I’m not a traveller myself but I’m off to buy a parrot. Good one Elaine, a worthy investment! I loved reading about your great adventures! Life is filled with these amazing opportunities and it’s wonderful you are taking the time to experience life in this way. Too often I see others stuck in their worlds and dreaming. The time is now! Speaking from one who knows…a cancer survivor of 9 months and counting!! What a ride this artsy life is! Nice to hear from you, really pleased you enjoyed the article. And you’re so right, it can be easy to get stuck in the ‘I’ll start tomorrow‘ mindset, thanks for sharing. Loved the article, still laughing. After all, what ‘s a good relaxing holiday without a near death experience? And I completely agree, we all should have a pet that tells us how good our paintings are…..eyeing my cat Pancho…hmmm….maybe not! Hi Monica, really pleased you enjoyed the article and you’re right, these experiences really do put the rest of the break in perspective. I do think talking pet for encouragement should be a must in all artist studios, let me know how the Pancho training goes. Hello Will, (with the same surname)! Hope you remember me, we spoke a long time ago and you helped me to tweek my painting of a Scottish Lighthouse!! Well I have just read about your adventures in Aix…sounds like a wonderful place to visit. Glad you survived the water ride experience! 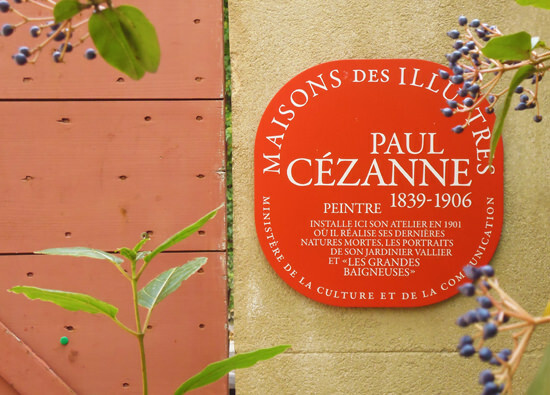 Would love to visit Cezanne’s place! 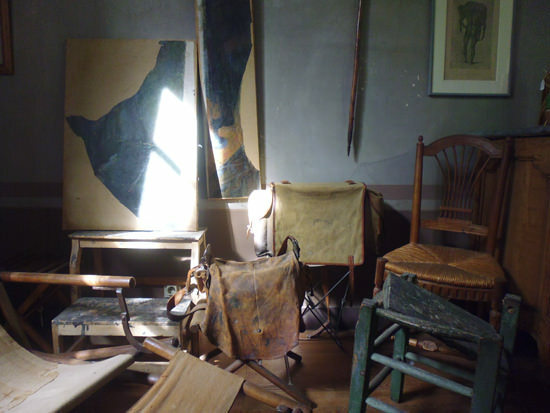 I visited Monet’s studio in 2005 which was positively inspiring to see. Loved your blog and your photos were quite amazing,inspiring… and a wonderful memory..you are a super inspiring painter yourself and Thank You for all your help. So nice to hear from you, Aix really is a wonderful place, the whole south of France is a fantastic area to visit. Thanks very much for you kind comments on the article and photos, really hope your paintings are going well. Hi Will, thank you for this beautiful story! you’re not just a great painter, you’re a big writer also! 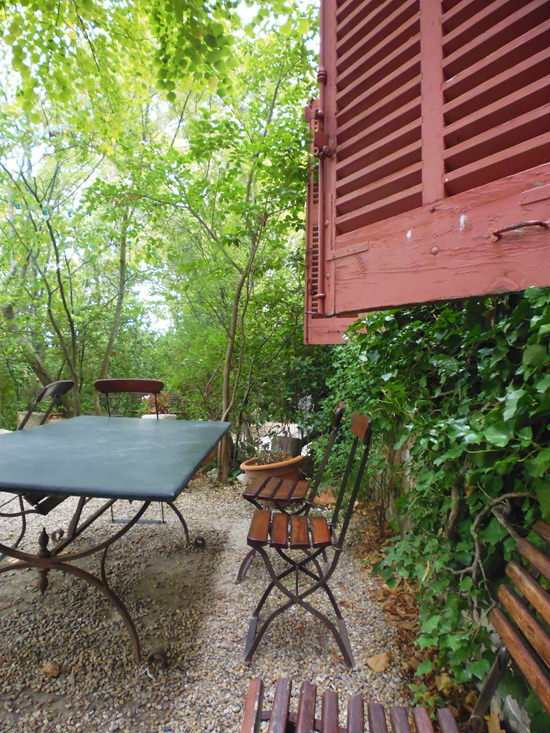 I can imagine how wonderful was your trip in Provence and especially your visit at Cezanne’s atelier :) This is the holiday I am dreaming of! It gave you even more inspiration, I believe so! Thank you for sending this fantastic experience, this gave more motivation and more inspiration to go on with my paintings! Cheers! Hi Andrea, very kind of you to say so. Really pleased to hear you’re feeling inspired by the article to have that motivation to carry on with your paintings. Will, What can I say, I was laughing out loud reading your horrific experience in flood water. Sorry about that! You told the story well and I just couldn’t help it. lol. It is still like a short film going through my head. But I am so glad that you got through it and were able to capture the amazing photos you did. Very inspirational words also about recreating yourself. I have thought, I wish I could paint without having to make it so realistic. I wish I could just let go and paint freely without having to be so perfect. Your words have hit a note and I am thinking it is time to just try and see what happens. Thank you for sharing. I was totally entertaining and very informative. Really pleased you found the story amusing, we can both laugh about it now and in fact Vanessa keeps on bursting into fits of giggles! Fantastic to hear you’ll be embracing a new looser style and just enjoying creating. Very inspiring and interesting article. I have developed quite an interest in art in my “later” years, and this gives me lots of hope. You mentioned the unique light in France. Have you ever been to Taos or Santa Fe, New Mexico? 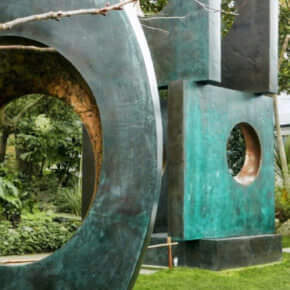 Those are places we dearly love, and they’re famous for their light….and art! Thanks for the enjoyable article. Thanks for dropping by, so pleased you’re feeling inspired by the article. I haven’t been to Santa Fe or New Mexico, it sounds like it could be a great stop for some new adventures, quick question though…do you have a rainy season? You’re welcome Catherine, really pleased you enjoyed it. Thanks for sharing this story. I, too, and so glad you are safe. I can imagine that you cherished the adventure all the more after surviving. Thank you for reminding me also of the struggle so many artists face, I needed that reminder! Thanks for a much for your concern Cheryl, kind of you to say so. It really is easy to forget that many of the Old Masters struggled just as much with their own inner critic as we do today. Hi Will, I was told once that if you have one talent then you probably have three. You obviously paint beautifully and by this posting of Cezanne’s studio and your journey there it is apparent to me that you are also a writer. You give me much inspiration with this story, as I too feel my own artwork isn’t any good. Thanks again. That’s very kind of you to say so. Tackling our own insecurities about our work is one of the biggest challenges when creating something new. However, If you’re not burning your work you’re one step ahead of Cezanne! Hi Will, what a great history of a great painter. My daughter is training to be an art teacher and your notes will be of great benefit to her (and me). Many thanks for your tutorials.Keep up the great work. Thanks very much Bridget, and thanks for passing on the notes to your daughter, much appreciated. Will, you are an excellent writer as well! What a talented young man! Very kind of you to say so Diann. What a wonderful adventure to see such works up close. I must put Cezanne on my list. I had the opportunity to wander a wonderful Manet exhibit earlier this year in Venice before returning to Canada and found the work and his life inspiring. Even those we consider masters had their ‘beginner’ frustrations so no self-deprecation. On to the canvas! Well said Tina! yes, even old masters have new doubts, the one thing that is constant is the artist’s output of work – to keep on creating. Wow! Sounds like a close call! So glad you lived to tell us about it Will! 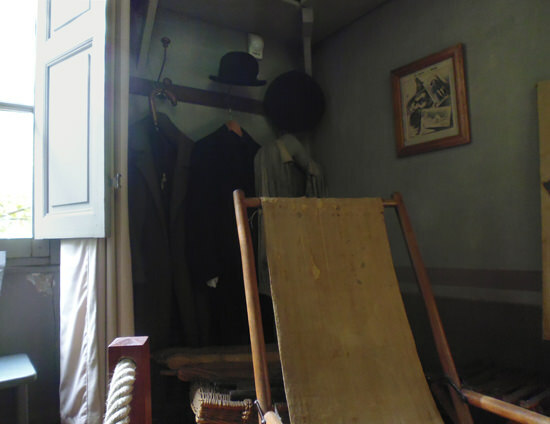 Thanks for sharing your visit to Cezanne’s studio and for the interesting info about his life. I sure can relate to the frustration he felt with his paintings that didn’t turn out the way he planned. Good to know he had so much success late in his life. All the photos you included were great. If you take other trips like that, I’d love to hear about them….I just hope they don’t all include life threatening situations! Thanks very much Jenny, so pleased you enjoyed the story and the photos. Hi Annie, congratulations on your BA (Hons)! a great achievement. Thanks Will, great article. I love my art, and aspire to do some travelling shortly in Europe to gain culture and inspiration for my art. I love history and good writings, thanks for yours. You’re welcome Sherri, pleased you enjoyed the article. Thank you Will for sharing your adventure and glad you got out of your predicament safely, very enjoyable reading. PS- enjoying your portrait video course not quiet finished the painting of you yet, taking a little longer than expected. Nice to hear from you, great to hear you’re enjoying working through the portrait course and pleased you enjoyed the article. Hi Will. I havent posted you before but wanted to say I am so pleased I subscribed to you tho I seldom get time to paint these days. Must try harder. So enjoyed your commentary of yours and Vanessa’s adventures in Provence and more pleased you survived the experience! Perhaps next time you go I could come along as your trip advisor and keep you both safe. After all, at 72 I have more experience and the small fee I would charge would eke out my pension. Lol Patricia. Great to hear from you and thanks for your comment. A guide for the trip would have been much help! so pleased you enjoyed the story. What an adventure in France! What a condensed history of Cezanne’s art journey with friends & family! What wonderful encouragement from you to us at the end of your piece. Thanks Will, for sharing your stories, your knowledge and yourself with us. Hi Debra, nice to hear from you, thanks very much for your kind comments. Hope your paintings are going well. Hi ! I love reading your stories. You make me laugh. I have learned so much from your website. I am so happy I found it. Great to hear it Debbie, thanks for dropping by. Hi Will, I love these kinds of adventures and explorations. Food for the soul and so inspirational. I am trying to persuade my husband to go on a street photography course in Paris while I go and explore the world of Cezanne and Van Gogh! I loved your story and illustrations, if you cant be there yourself it is wonderful exploring through the eyes of others! Thank you! Hi Eileen, really pleased you enjoyed the story, sounds like a great trade off for a street photography course! Aix is only about 3 1/2 hours by train from Paris so could definitely work as an artistic excursion! A ‘real’ plein air painter would have calmly pulled out his travel set, and painted a picture of the rising water. Everything was there, including water to quickly wash your brushes. (tongue in cheek, of course). Ha, ha, very true George! an expressive river scene opportunity missed! pleased you enjoyed the studio descriptions. Hi Will, thank you so much for sharing your gifts of talent and travel. You are blessed and in doing so you are a blessing. I am a senior citizen artist and struggle each time I create a painting so much. It is very difficult sometimes to keep painting. Emotionally and physically, but your words touched and encouraged my heart greatly. It is so true but why are we our own worst critic? You’re welcome Janice, it can definitely sometimes be a battle at the easel, mostly with ourselves! so pleased you are feeling inspired. Always enjoy the humor, and a good story. Cheers Eduardo, hope you’re keeping well. Thanks for the laughs…and not least, the facts with your opinions. Thanks very much, really pleased you enjoyed it. Thanks very much Bruno, very kind of you to say so. Thank you for sharing your trip to Paris. I am happy to have found you. Love reading the comments of your other Art Lovers also. Thank you all!!! Will, your Cezanne article is so well written, and inspirational. Thanks very much Julia, pleased you enjoyed it. Thanx for the great share on Cezanne. What a treat to view an artists studio, I allways find it fascinating. Its as if he had just stepped out for a moment. You’re welcome Loraine, pleased you enjoyed the article. Lovely to hear from you and pleased the mixing flesh tones video helped. Thanks for your kind words on the article. 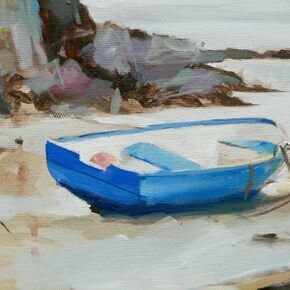 I first came across your site at the weekend after looking for help with a still life painting. The interest in the still life was inspired by Cezanne’s ‘Still Life with Plaster Cupid’, which I’m studying as part of an OU course I’ve recently started. So, as you can imagine your site and the above blog have made quite an impact! I feel very much enthused by what I’ve seen so far and achieved at the weekend by following your advice. Being in the over 50 category as of a fortnight ago I’m very encouraged to hear C painted his best in his 60’s, there’s time yet! So, I’ve ordered some new brushes and upgraded to Golden paints on your recommendation and plan to get stuck in without delay! Nice to hear from you, and sounds like the article was perfect timing for you. So pleased you’re feeling inspired and your best paintings are ahead of you! enjoy the new brushes and paints and love to hear how your painting turns out. Managed two things today; made some progress with the still life I started last weekend and also first ever post on wordpress! I seemed to wind up with an account after following your blog. I think if you follow the link above you can see the results of my efforts. Thanks again for the advice, onwards and upwards! Great one Jon, nice to see a glass in the still life composition, you’ve handled it really well. Thanks Will, the glass was interesting, it got the least time and I think worked best because you have to paint what you see, whereas with the fruit there might be a tendency to paint what you think, without looking enough, if that makes sense. A good lesson. I’ve noticed how well you observe colour and tone in your video’s, that’s a great skill to acquire, and must take a lot of practice. Your suggested limited palette made a huge difference for me. Previous attempts at painting haven’t been anywhere near as successful largely due to confusion over colour and lack of attention to tone. I’ve spent the last couple of years trying to concentrate on drawing (mostly life) with the limited time available. As you point out, drawing is the foundation for everything else. I think next I may try tonal painting with the 3 paints you recommend as a starting point. The still life was really enjoyable, but ambitious. I would really love to be able to paint a tonal sketch at the life session I do on a weekly basis. Having said that drawing seems difficult enough, more practice needed! Good one Jon, I think a tonal study with 3 paints is a really valuable exercise to help train your eye, mixing and judging colours without it becoming too overwhelming! You’re welcome Christel, pleased you enjoyed it! Hi Will, I thoroughly enjoyed your article; on the one hand it was entertaining (although I’m glad you survived the ordeal!) On the other hand, I found it inspiring and motivational. Thank you! Great to hear it Pippa, so pleased you enjoyed it. My favorite & most thought provoking quote of Cezanne was (paraphased) – “I can’t wait to get to Heaven to ask God what other colors He invented!” Wonderful article, thank you! Thanks for dropping by Catherine, pleased you enjoyed the article. Just booked the flights from ozz for me the mrs and daughters to do a version of the grand arts tour of Europe and London. 35 days from latish December this year till late Jan. In Amsterdam outa Roma. Thus your story got Aix and Arles on the itinerary. The trip grew from 3 to 5 weeks. 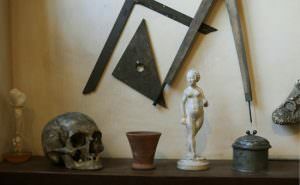 The continued odd studio, atelier or gallery pic, travellers tip, thrown into articles would be continually appreciated! Sounds like an epic trip John, I’ll try to weave some more tales in! Thanks Will.. it helps to know that there are many late bloomers who turned out so well. helps you deal with self-doubt.. thanks! You’re welcome Sandy, pleased you enjoyed the article. This wonderful information, and photos here are very profound and speak volumes about the artist. Thank you for sharing this with so many of us. I really do appreciate the valuable information you share with us here on videos, do so freely from the goodness of your heart. You are the best of all the rest. thanks very much for your kind comments and so pleased you enjoyed the photos. This is a great page, thanks for writing it. I was recently in Paris at the Picasso Museum, 3 weeks ago. Most of the work being displayed were made-up of sketches and a few paintings, all are wonderful. There are areas where I found some of the most beautiful landscapes and captured some photographs, upon viewing closer, the signature was Cézanne. The way he captured the light is admirable. One of the South of France view of the water was a favorite of my eye, in that section of the museum. Strangely, I found it comforting that Cézanne was a late bloomer. Being “not young” myself, I know I can succeed in this unknown world of painting. Hi David, really pleased you enjoyed the article, yes there are some fantastic Cézanne’s around Paris, glad you enjoyed your trip. Hi Will, I too am a late bloomer and have barely touched the idea of painting. Isn’t it funny how things change. I have always loved art and seeing others be creative and simply didn’t believe I had it in me to do anything like that. I finally got it through my head one day that even the great artists had to practice, practice and practice some more, before they got to the point of actually creating their masterpiece. So that is what I’m doing now and after a year or so, I think I finally am beginning to see improvements in my craft. I got started wanting to learn how to sculpt human faces and figures and every time I attempted it I ended up with some very nice looking ogres! lol. I couldn’t even draw a face, let alone sculpt one. And I fully understand Cezanne burning certain projects, been there, done that. Not proud of that but I’ve learned even from that so I guess it has it’s lesson as well. What I wanted to say is that your writing style is most excellent as well as your art and it looks like you have several talents in expressing yourself. Painting a picture with words can sometimes be as challenging as any other medium so Kudos to you. One of these days I will take a class with you, but unfortunately since retiring the financial picture prevents that happening anytime soon. But I still learn something new every time I visit your site so Thank You for all you do, you are a good heart. Hi Pam, nice to hear from you, and yes, it’s such a valuable lesson that every great master was a beginner once. So pleased you’ve been enjoying the articles and lessons. Thanks once again for taking me along on your adventure & letting me experience Cezanne’s studio. It is inspirational. Love your writing & all your helpful instruction! Thanks very much Debra, so pleased you enjoyed it!